The sudden plummet back into real life after a great trip abroad is a lot like plunging into ice water on a cold day… it takes a special kind of stamina. For years, I’ve consistently struggled to learn how to deal with the “shock,” and ease back into reality with grace and appreciation. 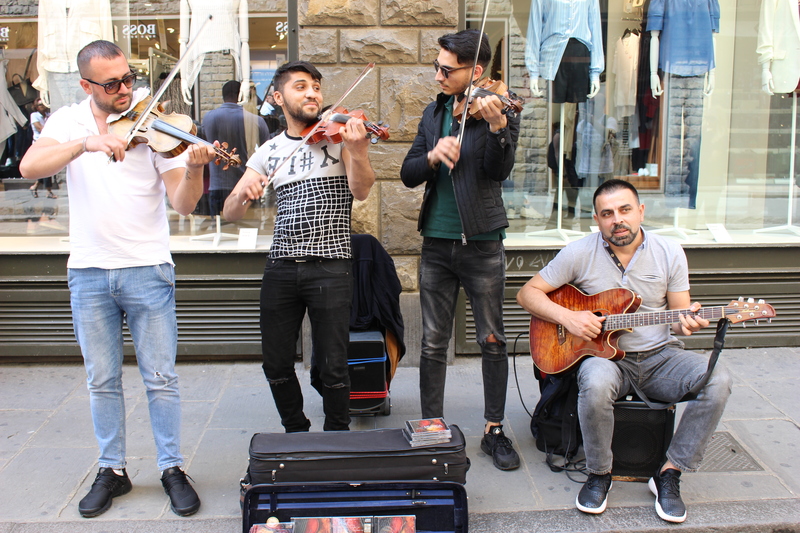 Inevitably, my husband and I find ourselves suddenly having to jump with both feet right back into our hectic American lifestyle, even as we’re still struggling to hold on to that calmer, more peaceful, more restful life we savor in faraway places. Still in a head-fog from the nine-hour time change on our recent return from an absolutely perfect three-week long trip to Europe, Dan and I headed out for a commitment in our back-to-reality life, struggling with a sense of emptiness and the inability to hold on to the awesome experience we’d just savored. As we got into the car, I absentmindedly popped a CD in… and in that single instant, the beautiful strains of violins and Bocelli’s “Con Te Partiro” (“Time to Say Goodbye”) filled our space, and just that quickly, both Dan and I were transported, as it were, back to the ancient city of Florence, Italy… strolling at night from the majestic Duomo on the piazza to the Ponte Vecchio as street musicians filled the air with music that reverberated through the beautiful narrow stone streets and buildings. 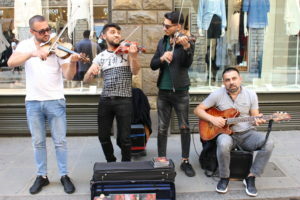 That night in Florence, four young street musicians were gently interrupted by an Italian policeman after their breathtaking, upbeat rendition of “Pachabel’s Canon in D.” Unable to provide a permit, they quietly packed up their instruments and moved on, but not before Dan hurriedly bought one of their CDs… and I’m so grateful he did! It became a treasured memory for us– a means to help us float back down to our own reality. That’s what good souvenirs should do– help the traveler to gently come back down to earth after flying high with breathtaking experiences of traveling the world. And like all good travelers, I’m slowly learning this fine art. At this point, I’ve successfully honed my souvenirs into three basic things: music, photography, and Christmas tree ornaments. I can thank my daughter-in-law for the Christmas tree ornament idea. When Dan and I started to travel in earnest, I’d asked her for some ideas of small souvenirs I could bring back for the grandkids, apart from candy. Admittedly, there’s just nothing as much fun for kids as a candy bar that’s called “MELKESJOKOLDE.” Well, no, I take that back. In our family, the universal favorite candy from abroad remains, hands down, the Kinder Egg, which can be found all through Europe or Canada, but not in the U.S.A.
Candy aside, my daughter-in-law’s immediate response was, “Christmas tree ornaments!” And that set me in a perpetual mindset to keep an ever-vigilant eye open whenever I travel, looking for cute or beautiful ornaments for the kids that reflect the culture and rekindle warm memories of the city or country we spend time in. Regretfully, it took a long time for me to wake up and consider collecting ornaments for myself, and I’ve missed a lot of great opportunities for my own tree. I’m trying to make up for lost time now, and I’ve got a growing collection of lovely Italian hand-painted ceramic ornaments, little Eiffel Towers from Paris, miniature Italian masks from Venice, tiny Scandinavian houses from Norway… etc. Still, as far as travel memories go, photography has remained my constant from the beginning of our travel experiences till now. 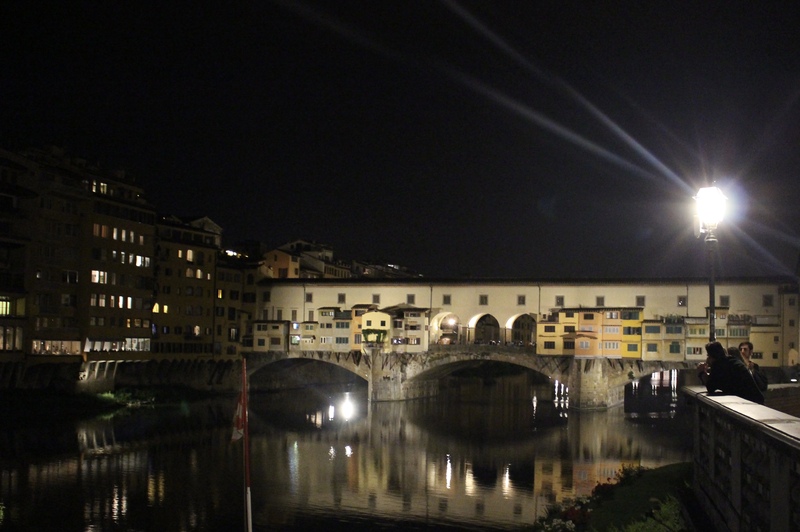 My ever-present Canon EOS 100D goes everywhere with me, and is itself a travel memory. Last summer, after a decade of hard work (you must understand that with eleven grandkids under the age of 12, my faithful Canon had tirelessly captured many, many, many photos) my camera died on Picadilly Circus in London. A compassionate British gentleman at a London photography shop confirmed its demise. This presented a significant dilemma, especially since I had promised my ten year old granddaughter that I would photograph the Eiffel Tower for her at the end of our trip to England and France, which was just beginning. Our iPhones had to suffice during the remainder of our London stay, but soon after we arrived in Oxford for our week-long study at the Kilns with the C.S. Lewis Foundation, I buckled and bought a new Canon at a shop in Oxford, England. Gratefully, this new “British” camera has become a good and faithful travel companion. The trouble is, any single travel adventure results in hundreds of photos. So what do I do with them? My best idea so far was having a photo of beautiful Civita di Bagnoregio blown up into a 16×48 canvas that hangs on the wall above our bed. 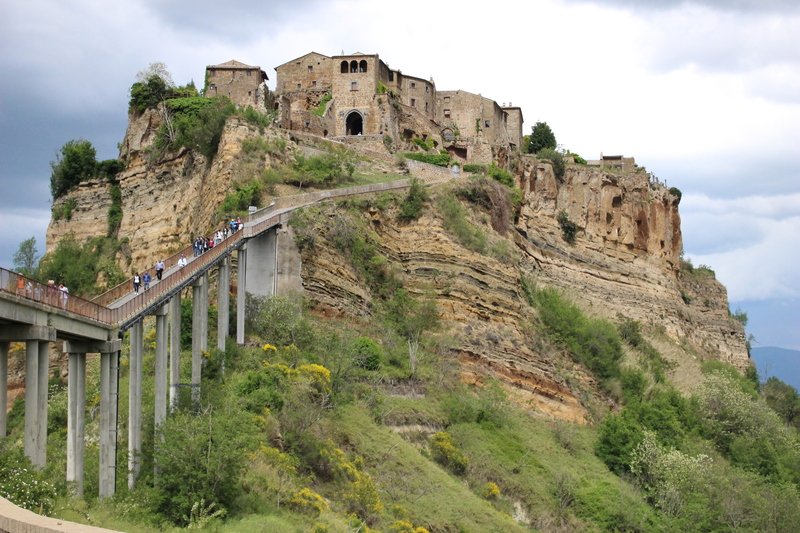 Civita di Bagnoregio is probably the smallest and oldest hilltop city in Tuscany. Much of it has eroded over time, and the town almost died until tourism began to breathe new life into it. 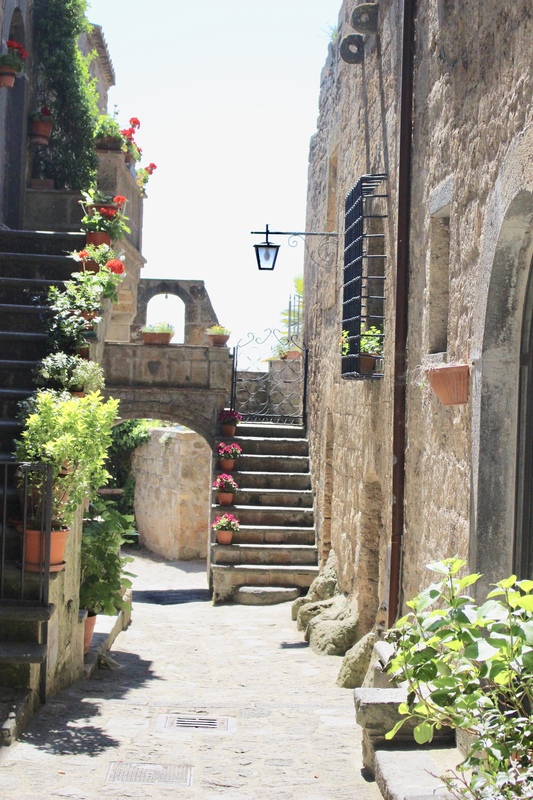 Four years ago, Dan and I were having lunch there with our friends at a breathtaking little Tuscan restaurant, Alma Civita. 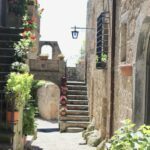 Overwhelmed with the beauty and authenticity of this ancient Etruscan town–accessible only by a long, steep pedestrian bridge– Dan and Dave were inspired to seek out two very medieval rooms so we could spontaneously stay the night, which we did. The experience was one of the most amazing travel memories ever! Four years later, Dan and I returned to this unbelievably beautiful place, but this time with our three grown kids and our kids-in-law, and together we created the most amazing travel experience yet! It was a dream come true. The canvas above our bed is a perpetual testament of this– that sometimes, amazing dreams really, really do come true! Our home is both designed and decorated with a subtle travel theme, and my framed or canvas photos of places we’ve been to adorn the walls throughout– the walled city of old Dubrovnik, Croatia; the Grand Canal of Venice; Dan riding a camel in Cairo, Egypt; the coliseum in Rome; the amazing ruins of Ephesus; the waterfront of New Haven in Copenhagen, Denmark…We live surrounded by memories! After every trip, I design a computer photo album of the best and favorite shots of that trip. We keep a stack of these travel albums by the fireplace, and both Dan and I frequently cozy up by the fire with a hot cup of cocoa or coffee as we slowly turn the pages of each album, remembering. I haven’t mentioned yet that these three souvenir ideas– music, photography, Christmas tree ornaments– are all perfectly suitable for squeezing into the small, single carry-on that Dan and I have each become pretty proficient at traveling with. One of the greatest temptations of traveling is to fall into spontaneous, hodgepodge purchases. But I’m learning to focus, with huge success in wisely capturing travel memories that do exactly what they’re supposed to do: bring back the magic of experiencing amazing places in this big, beautiful world.